Key Mistakes made by Accountants – and how to avoid them! Here at Clearly Coaching & Leadership, we believe that every individual has the potential to be a great team player, a fantastic communicator, an effective manager and even an inspirational leader. What they might need from us is to be shown how to use the talents they already have to their best effect. Our Coaching and Personal Development Programmes are led by our team of experienced and professionally trained facilitators. Steve Carlyle & Amanda Moorhouse are both experienced business managers who have real life practical experience of developing, motivating and shaping individuals and teams. This business experience is combined with their NLP training and many years of training & coaching others to give you a fantastic and effective coaching experience. Our team can provide you with a course to introduce people to basic techniques such as communication and rapport building in a group or can work with individuals on a one to one basis to help them find their strengths and overcome their weaknesses. When you are given the challenge of managing a team or leading an organisation you can benefit from our support and encouragement. You have the talent to perform but we can show you how to use it to its best effect. View full details of our coaching courses. Being asked to manage others is a great reward for your efforts. Someone has recognised your talent but you want to lead your team well and make great decisions. You want to know how you can do this while being you still. We can show you how to manage well with the skills you already have. It’s already within you, we just show you how and where. We can also show you how to be a credible and inspirational leader. We can talk to you about how others do it and we can show you how you might achieve the same results. 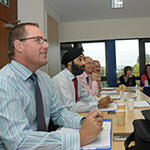 View full details of our leadership courses. Have you ever wondered how others build great relationships quickly and effortlessly? For some it’s a natural gift but we believe everyone has the talent within them to be a great communicator and to build fast and long lasting rapport with colleagues, customers, suppliers and all other business partners. If you have a query or would like some more information regarding any of our courses please contact our friendly team by calling us on 01904 639923 or clicking on the button below. © Clearly Consulting & Training Limited 2019. All rights reserved.